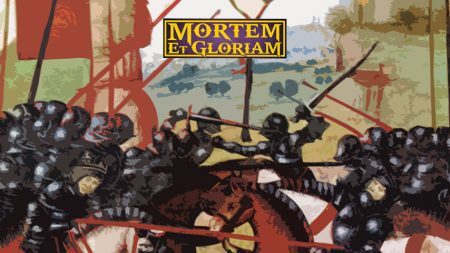 Mortem et Gloriam (MeG for short) is a wargame where you take charge of an army from the ancient world – loosely defined as the period before gunpowder and firearms. You command an army of 50 – 100 bases of painted figures, moving them on a table with model terrain that represents a battlefield. You are the Army Commander and, with your key Sub-Generals, control your army in attempt to smash your opponent. So you could be Alexander with his leading subordinates Parmenio and Ptolemy, or Hannibal with Hasdrubal and Hanno, or Vercingetorix the Gaul with the leaders of the main Gallic tribes, or Ghengis and Kublai …. the choice is yours. 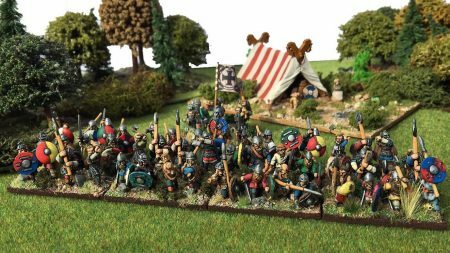 The figures represent the different types of troops that make up your chosen army – be they Macedonian Pikemen, Gallic Warriors or Teutonic Knights. The armies of the ancient era varied enormously from Roman armies of solid legions and their auxiliaries, to steppe armies of nomadic horse warriors. This variety is one of the great things about ancient wargaming. We now have almost 120 Classical lists, 60 for the Dark Ages, with 30 Chinese, 30 Biblical and 60 Medieval coming out this year. Mortem et Gloriam has the mechanisms to make Huns feel like Huns, and Romans feel like Romans. So when you play as Attila, the tactics that worked historically for him will work on your table-top battlefield. An army is made up of sets of bases representing the units or groups of units operating together. These are called Unit Groups (UG for short). Historical armies were commanded this way – rarely did units operate alone, they tended to be grouped together with others to make controlling them easier. So three real phalanx units would work together, or two tribes of war-band would be merged and so on. A Mortem et Gloriam army typically has 10-20 of these Unit Groups. There are actually two types of Unit Group: 1) Tactical Groups (TuGs) of main battle troops) and 2) Skirmish Groups (SuGs) of light troops. A typically infantry TuG is 8 bases, and a cavalry TuG is 6 bases – although again there is a variety to cover all types of unit and army. For instance an Elephant TuG is 3 or 4 models. You can use any basing convention as long as both sides consistently use the same base widths. We measure the attrition, damage and reduced fighting ability of each Tactical Group (TuG) by reducing its number of bases. The basics of the rules are very simple. Kill half the bases in a TuG and it breaks and runs away; kill one-third of a Skirmish Group (SuG)and it disperses and runs away. So a typical foot TuG of 8 bases will break and run away when it loses its fourth base and its fighting capability will have been dropping with each previous base loss. SuGs are typically 6 or 9 bases and so break on their second or third loss. Destroying an army is equally simple. Break half of an armies Tactical Groups (TuGs) and the army will run away. You cannot win a battle in Mortem et Gloriam by just killing enemy Skirmish Groups (SuGs). You have to destroy the opposition’s battle troops. Damage is cause by rolling the special Mortem et Gloriam Death Dice. These are a set of dice in five colours: BLACK, WHITE, GREEN, YELLOW and RED. There are three symbols on the dice: a Skull, a Crossed Sword & Arrow, and a fancy S (short for “special”). When you roll the Death Dice, a Skull symbol kills an enemy base – simple! The Crossed Sword & Arrow symbol causes a wound – and two wounds kill a base. And the fancy S generates special effects. You have a wide range of tactical options and choices to make as an Army Commander. These are all managed using Mortem et Gloriam Command Cards. The cards mirror the colours of the Death Dice with BLACK, WHITE, GREEN, YELLOW and RED cards. There are 8 BLACK, 12 WHITE, 16 GREEN, 12 YELLOW and 6 RED in each pack. The basic concept is the same as the Death Dice – RED cards are the best and BLACK the worst. RED cards will allow sophisticated moves, BLACK cards generally allow nothing at all. Better generals get more cards. So if you choose to be Alexander (who is a Legendary General) you will get 5 cards each turn with which to command his troops. If you are playing Darius, a Mediocre General, you will only get 2 cards each turn. The final twist in the movement part of the game is that there are three types of troops: Drilled, Formed and Tribal. Drilled troops find things easy to do – so rarely need better than a GREEN card to do things. Tribal troops find all but the basics more difficult, and will often need YELLOW and RED cards to do sophisticated things. There is a rich variety of different moves to choose from in the game – the cards are used to pay for all of these. So more cards, of better colours will always be a good thing. The Command Cards are played alternately in Mortem et Gloriam – you play a card to prompt an action, then your opponent and so on. This creates a system of movement that is inter-woven rather than the I-move-everything /you-move-everything of recent decades. Instead you will find there is an ebb and flow of actions and counters occurring continuously. Better Generals with Drilled troops can react more easily to an opponent’s actions than poorer Generals with Tribal troops. You will also find yourself playing your cards in different phases of the game to perform tasks during fighting as well as movement. There is simply no such thing as “my go” – both players are involved all the time. Mortem et Gloriam is designed to be played at a fast pace. The pre-amble phase of the battle has all the grand tactical options you need, but they are resolved quickly – so you will usually be in action within 20 minutes of moving the first troops. The game is designed to be a fast moving and bloody affair, and like most battles, even as the victor you will usually have suffered – hence, “nobody gets out unscathed!” The game is designed to be played to a conclusion in 2 hours once you are familiar with it. The command mechanisms allow a great deal of finesse within the game. As you play you will increasingly see the wide range of choices you have as an Army Commander, and how vital some decisions are. The role you give to your Sub-Generals at the beginning of the game is as critical as it was in reality. 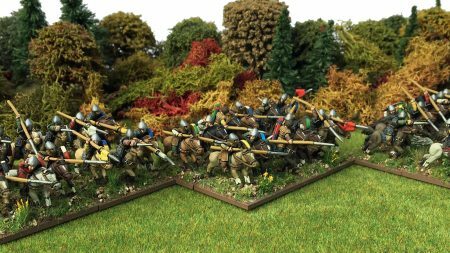 You also have considerable flexibility in how you design your army using the Mortem et Gloriam Army Builder, and you will need to design it with your tactics and style in mind. Skirmishers played a key role in the ancient period and you will find they have their own feel and effect in Mortem et Gloriam – but they rarely dominate the battle field. As mentioned, you simply cannot break and army by destroying skirmishers alone – you have to break half your opponents TuGs. 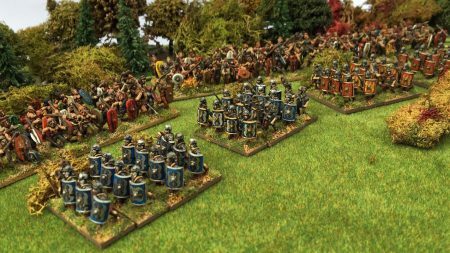 Armies vary hugely in their TuG/ SuG mix: a Roman army might have no SuGs at all, a Parthian might have only 4 TuGs of fully armoured cataphracts but a dozen SuGs. Used well, Skirmish Groups can harass and slow an opponent, but they will rarely win a battle on their own – and in Mortem et Gloriam they do this through the effect of their shooting rather than just their presence. You have to fight with the main battle troops to win – so using a Parthian army well is a challenge as you have to soften the opponent up well and use your cataphracts very carefully as you cannot afford to lose them! In history one of the key skills of the best generals was to engineer when and where their armies fought. This was as important as their battlefield skill. In Mortem et Gloriam better generals give you a greater chance of forcing a battle on the terrain you prefer. Mortem et Gloriam deals with the run up to the battle with a simple game-within-a-game, called the Pre-Battle System. This represents the five days prior to the battle and determines where the battle is fought. If you are the invaded player you choose a “map” for the type of territory where you would like to fight the battle, and you decide where you want to try to set up. But the opposing general will try to work you out of this position and into terrain better suited to them. The result of this Pre-Battle System represents a combination of armies making mistakes, having to move to forage, or failing to understand where the enemy is and so on. First and foremost this is a game and should be fun. The design objective throughout has been to achieve this while making sure the rules portray what we do know about ancient history. There are areas of ancient history that are fairly well understood; but many others where different interpretations are possible. I have tried to err on the side of interesting and enjoyable wherever there is doubt. So shuffle the Command Pack, start rolling those Death Dice and enjoy!